Aged 15–25, interested in a career in arts and culture, but not sure where to start? Come down to a careers fair with a difference. Find out about different roles and career pathways at Tate and discover what it’s like to work in the creative and cultural sector. Browse stalls run by Tate staff, meet a range of art professionals face to face and find out what their roles involve and how they got to where they are. To celebrate International Women’s Day, see a series of inspirational, honest and real conversations from women and non-binary creatives, put together by guest curator Yewande "YoYo" Odunubi and introduced by Frances Morris, Tate Modern Director. Ever wanted to ask industry professionals what advice they’d give to someone starting out? Or what challenges they faced in their early career and how they overcame them? Hear first-hand accounts and honest insights from creatives working across design, cultural programming, tech, publishing and advertising. Please note the talks require a free ticket. Tickets can be booked via the links in the schedule below. A small number of tickets will be also available on the door. Places are limited and on a first come, first served basis. Aimée is co-founder of newly launched Knights Of – a commercial children’s publisher focused on hiring diversely and commissioning writers and illustrators from a diverse range of backgrounds. She is a supportive and engaged voice within the industry, and is commited to promoting inclusivity and diversity. 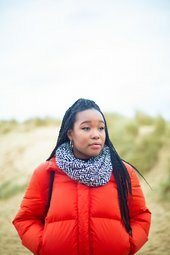 Amie is a graduate from South East London who started in the creative industry (with no experience) via an internship called The Pipe 2 years ago. Amie was nominated a creative of tomorrow by the British Arrows. She cofounded Ogilvy Roots, a BME network dedicated to championing greater ethnic and cultural diversity within the industry. Frances has played a key role in the development of Tate, joining as a curator in 1987, becoming Head of Displays at Tate Modern and then Director of Collection, International Art until 2016 when she was appointed Tate Modern Director. 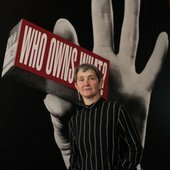 She has continually worked to re-imagine Tate’s collection and has been instrumental in developing its international reach and representation of women artists. Niccy is a born Londoner, a Brit School graduate and currently Station Manager of newly launched internet station, Transmission Roundhouse, the home of radical talk radio, podcasts and specialist music for under 30s, powered by the Roundhouse. She is also a freelance audio documentary maker, artist manager and live events producer. Soofiya is a visual artist, designer and design educator. Their art and design practice centres around illustration, visual identity and book design. 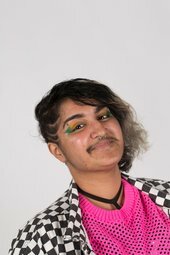 Soofiya is a lecturer at Ravensbourne in London and speaks, teaches and facilitates workshops focusing on graphic design, activism, politics and gender. 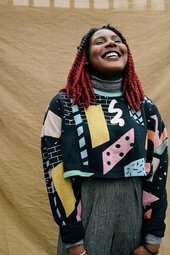 Tobi is a cultural producer with 8 years experience specialising in live performance, events & festivals and film, creating experiences around socio-political activism, community engagement and artistic collaboration. 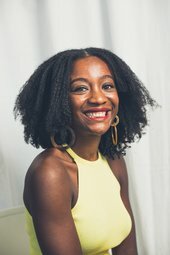 She is currently Executive Producer (Up Next) at Bush Theatre producing BABYLON Festival and is the founder of the Black Ticket Project initiative. Tolulope is Founder of Coders of Colour and a university student. Tolulope has loved technology from a young age and taught herself to code at 13. After attending several hackathons and tech conferences, she realised hardly any attendees resembled her. She set up Coders of Colour to show young people of colour that a career in tech is achievable. YoYo is an arts programmer and event producer passionate about creative exchange and widening access within the arts. She supports and delivers programmes that give emerging creatives and artists opportunities to grow and develop. YoYo is currently Friday Late Programme Producer at the V&A and Visual Arts Production Manager at Brainchild Festival. Whilst you're here, chill with friends, meet other young people interested in creative careers and ask our HR team about the process of applying to various roles at Tate. Are you teacher? Speak with the Schools & Teachers team about what’s on offer for schools and colleges. Get a chance to speak to staff who work across Tate Britain and Tate Modern. Find out about a range of roles at Tate including curating displays and exhibitions, looking after artworks or working in Library & Archives. Speak with staff who work in Catering, Retail and Publishing. Learn what’s involved in raising money for Tate, communicating with our audiences or working with visitors on a day to day basis. Meet staff who work in human resources, produce digital content for the website or run a range of workshops, events and projects for all ages. Plus ask our invited guests what it’s like to study at university, gain experience in tech sector or work in the Commercial Art World.